Suffering from puffy eyes, dark circles or even fine lines? 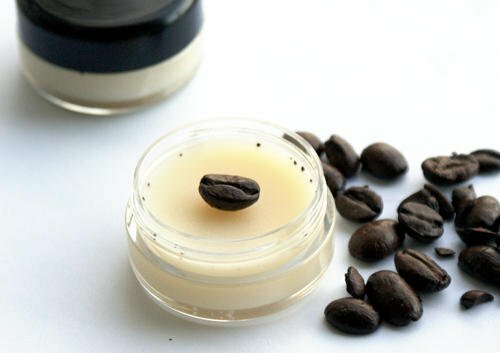 This DIY coffee under eye cream may be able to help! In my last post I mentioned that I had recently purchased and tried 100% Pure Cosmetics’ Organic Coffee Bean Eye Cream made with Arabica Coffee Seed Oil and Green Arabica Coffee Seed Oil and as a result concocted my own coffee bean infused oil for creating my own version of a caffeinated DIY coffee under eye cream that would help with those morning dark under eye circles, puffiness and even fine lines. I strayed from the ingredients in 100% Pure Cosmetics product a bit but I was rather pleased with the results of my own DIY coffee under eye cream which creates a smooth, rich cream that smells like delectable coffee. I used natural ingredients known for their anti-inflammatory properties like shea butter, olive oil and lavender & chamomile essential oils, as well as jojoba and naturally anti-aging rosehip seed oil which have skin rejuvenating properties with evidence that they reduce fine lines and wrinkles. The end product is smooth and creamy and literally melts right into skin. A little goes a long way. You can either make this recipe for one large container or pour the cream into smaller sized lip balm pots for gifting and sharing. 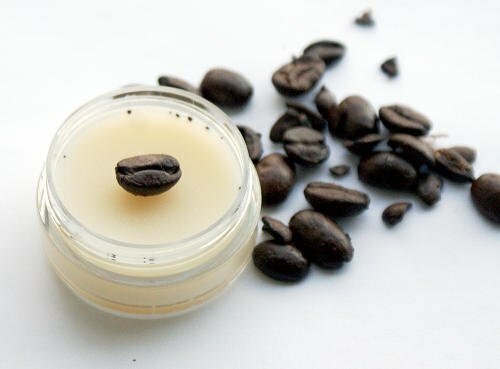 If you like my DIY coffee under eye cream, you can also use the coffee infused oil you make for this recipe to create my other recipe for homemade coffee lip balm. Don’t want to make your own? 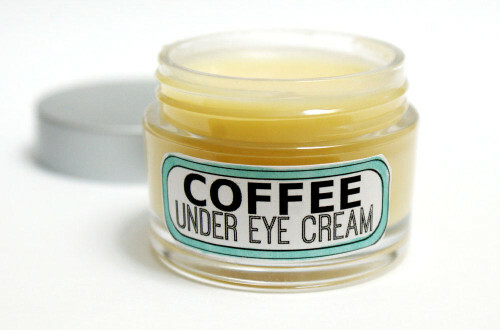 You can buy artisan crafted coffee under eye cream as well as coffee under eye serums here. Coarsely ground 3 Tablespoons of whole (unflavored) coffee beans in a coffee grinder. Combined the grounds with 4 oz. by weight of olive oil over low heat for about 15 minutes, then strain the oil using either cheesecloth or a coffee filter in a pinch. As I didn’t have cheesecloth handy, I improvised by taping a coffee filter to the top of a cup then poured the coffee and oil into the filter. Once the majority of the oil dripped through I carefully removed the filter and then squeezed the rest of the oil out into the cup. Using a digital scale weigh out the shea and cocoa butter into a glass Pyrex measuring cup. Heat in the microwave until melted, then weigh out the coffee infused oil, rosehip seed oil and the jojoba oil and stir into the melted butters. Next, using a different 3ml Graduated Plastic Transfer Pipette for each essential oil, measure out and add the chamomile and lavender essential oils and mix into the other ingredients. Finally, add several drops of vitamin E if desired and pour into your container(s) of choice. 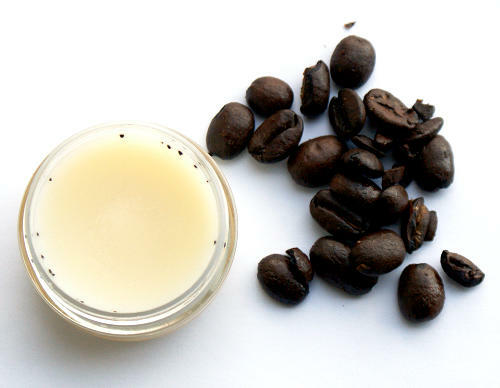 This DIY coffee under eye cream recipe yields approximately seven 10ml or 1/3 oz. lip balm pots or will fit into a 2 oz. container or jar. Notes from the crafting kitchen: Keep in mind that my DIY coffee under eye cream take some time to thicken. I’ve had products like this take a day or two to thicken at room temps and up to several hours to thicken fully in the fridge. Also, as I did go back and experiment with various coffee options, note that using pre-ground coffee beans vs. coffee beans you grind fresh as well as the intensity of the roast – light, medium or dark – will determine the final color of your oil. Pre-ground and darker roasts make a much darker oil than grinding the beans yourself and choosing a light roast. Also, straining with a coffee filter over all other methods produces a much lighter oil with fewer coffee grains sneaking through. Also keep in mind that ingredients from different suppliers will yield slightly varying results. I do not recommend using oils from the grocery store, but rather oils meant specifically for cosmetics and soapmaking for the best results and a longer shelf life. If you like my DIY coffee under eye cream, then you may also like my Natural Anti-Wrinkle Facial Serum Recipe for Dry, Mature Skin as well as my Natural Handmade Nourishing, Anti-Wrinkle Under Eye Cream Recipe. For more DIY beauty projects like this one, be sure to follow my DIY Bath and Body board on Pinterest. You can also follow me on Facebook, Twitter, Instagram, and Blog Lovin’. Or subscribe to Soap Deli News via email for future updates, DIY projects and recipes. This looks amazing, I will definitely have to give it a try! I can only image how great it smells! I love everything about this stuff….it brightened my eyes so much….it feels good, smells heavenly…..and the plus I love is that I use it as an eyeshadow primer base and it’s amazing… My colors pop and when I take my makeup off my eyes are silky smooth…thanks so Much Rebecca….this stuff is amaaaaaaaaaazing!! Great idea and execution… love that you used actual natural products!!! So excited to see more of your site and blogs. can you substitute something for the rosehip seed oil. I don’t have any and want to make these. Also it is very expensive. Thanks. You could sub another carrier oil for the rosehip seed oil though I chose this oil specifically for the properties it lends to skin. Could you infuse rice bran oil with rose petals as a substitute? You can sub the carrier oils with those of your choice however depending on the oils used it can change the properties of the final product based on the properties those oils offer. I made this recipe today but for some reason my liquid is not hardening. I made exactly 7 10ml chapstick containers worth so it does not appear that I had major weight differences. Not sure if i should add more cocoa butter or what. If you don’t stick these in the fridge to harden, it can take a full 24 to 48 hours for them to become a cream consistency depending on the temps in your home. The shelf life will be the life of your shortest oil. You can use coffee essential oils. Sub olive oil for the coffee infused oil and add 2% of the total oil weight in coffee eo. It should be similar but I haven’t tried it that way so I can’t say positively. I will be making this one to sell after I make a large supply order. Look for it next month at Rebecca’s Soap Delicatessen. You can omit it and sub with another of your choice that’s less expensive and has anti-inflammatory properties. My batch came out very dark like the color of coffee. How did you get yours to come out so light? Did you use regular coffee or instant? I strained mine through a coffee filter and it kept most of the coffee bits out of the oil. The bottom did have some coffee bits that made it a little darker in spots. Instant will instantly go dark as it’s not the same thing. I used freshly roasted beans that I roasted myself. They were a dark roast and turned the oil very dark. I strained the oil 3 times with a coffee filter to remove the coffee grounds. What was left was a dark coffee infused oil. I’m thinking that this is what made mine so dark. What does you coffee infused oil look like? I used a light roast and it was a tannish color. That must be the difference. Well, no matter. It smells wonderful and has a nice consistency. Thanks for sharing. Do you have any of this for sale yet? I would love to buy some. Thank you. Unfortunately I do not. I’ve had a supply order lost (stolen?) in transit and it will be next month before it’s available. Rebecca, any thoughts as to substituting avocado oil for the jojoba? Jojoba makes me itch like mad! Also, what about omitting the eo’s? I only ask because of the scent so close to my eyes might give me a bit of trouble. Thanks for your input! There’s not enough eo in this that you will notice a fragrance from them. It smells lightly of coffee and nothing else. You can sub the jojoba with any carrier oil of your choice. For oils subbed with shorter shelf life’s I’d also suggest adding 5 drops of rosemary extract. Wow. I can not wait to to make this. I’ve been trying to find something for my dark circles and puffiness forever. The natural products are too expensive and the chemical one work great, but…. Thank. You!!!!! Question for you, why the preference in olive oils, is there really that much of a difference between store bought and ones made for bath and beauty use? Do you think I could substitute olive oil for another oil? For example, grape seed or apricot? hi, can you re-melt this down to pour into containers at a later date? or does it need to set as it will be used? My batch has come out quite oily and tho it hardened in the fridge once I removed it and went all squishy again…not sure what I have done wrong? Would u suggest adding more coco butter? Tried it and loved it!!! Great recipe! Could I substitute almond oil for the jojoba and/or the rosehip seed oil? I have almond oil on hand and I haven’t found the other oils. What do you think? Thanks! Just making sure I am reading this right – when you made the coffee infused oil, did it make more than the 1/2 oz you used?